It is the CCP, not the DPP, that stands in the way of reconciliation in the Taiwan Strait. Tsai Ing-wen has just been elected as Taiwan’s first female president. A common narrative has been that her election will lead to greater tension in cross-strait relations and thus greater tension in U.S.-China relations. Her leadership of the independence-minded Democratic Progressive Party and her refusal to accept the “One China principle” – the idea that the mainland and Taiwan are part of “one China” – will make it difficult for Tsai to manage Taipei’s relationship with Beijing, or so the argument goes. Counterintuitively, however, Tsai Ing-wen’s election will be a boon for strategic stability. Indeed, Tsai has made clear that she will not undo the work of current president Ma Ying-jeou, who made closer ties to the mainland a cornerstone of his administration’s policy. To Ma’s great credit, more than 20 cross-strait agreements were signed during his eight years in power, allowing Taiwan to better take advantage of Chinese economic growth. But with Taiwan’s economy floundering, domestic political consensus on the island broke down as many in Taiwan became concerned that ties were advancing too far, too quickly. Ma read his 2012 reelection as a mandate to continue his cross-strait policy. But he should have read the blowback to his campaign suggestion that talks on a peace treaty were within reach as a warning sign to slow down rapprochement with Beijing. Just two years later, waning support for his policy of détente was made plain when students occupied the legislature and prevented ratification of the cross-strait agreement on trade in services. The Achilles’ heel of Ma’s approach lay in the domestic political constraints on further advances in cross-strait ties. Political negotiations were never in the cards, but, not recognizing this, Beijing came to believe that its strategy for unification – that economic integration would inevitably lead to political integration – would work. First Hu Jintao and then Xi Jinping failed to consider that familiarity might breed contempt, or that the differences between China and Taiwan had grown more numerous and more significant than their commonalities. As a result, the KMT’s swoon and the return to power of the DPP came as greater surprises than they should have. At a time when Xi Jinping is purging political rivals, reorganizing the People’s Liberation Army, and overseeing a flailing economy, it is unclear if he can take in stride the strategic failure that is his cross-strait policy. In the near-term, Xi Jinping may feel he needs to respond harshly; neither economic pressure on the island nor coercive military signaling is out of the question. But assuming that Xi has no appetite for a full-blown crisis – one that could draw the United States and Taiwan closer together – the Chinese president will eventually have to deal Tsai Ing-wen. Tsai has made clear that she wants to preserve the cross-strait status quo. She is unlikely to reverse steps that the Ma administration took, and she may even pursue deeper economic ties with the mainland at the same time as she seeks to diversify Taiwan’s trade partners and to join the Trans-Pacific Partnership. But in engaging with the Tsai administration, Beijing will have no illusions about what is in the realm of the possible when it comes to the cross-strait political relationship. Xi Jinping will have to deal with Taiwan as it is, rather than as he wishes it to be. In the medium term, realistic expectations on both sides of the strait will contribute to greater stability, especially if the Taiwan electorate’s rebuke of the Kuomintang prompts Beijing to reassess whether unification is really within the realm of the possible. Meanwhile, Taiwan and the United States must continue to work together to enhance their ability to deter China from pursuing unification via forceful means in the longer term. Finally, Tsai’s election serves as a potent reminder that the ultimate solution to the cross-strait conundrum lays in China’s own political evolution. Absent the embrace of liberal democracy in China, peaceful unification is all but impossible because Taiwan’s people will reject it; and a liberal, democratic China may, in the end, have limited interest in unification with Taiwan. Leaders in Beijing and in Washington would do well to recognize that it is the Chinese Communist Party, not the Democratic Progressive Party, that stands in the way of reconciliation in the Taiwan Strait. Michael Mazza is a research fellow in foreign and defense policy studies at the American Enterprise Institute (AEI), where he analyzes US defense policy in the Asia-Pacific region, Chinese military modernization, cross–Taiwan Strait relations, and Korean Peninsula security. 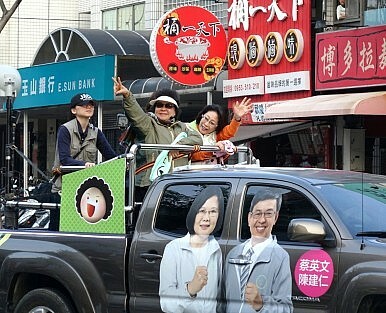 Cross-Strait relations have improved markedly, and elections in Taiwan need not reverse that.